The bubbly design of new Bed Head Rock N Roller brings the style lovers a big scale of style options. Lose yourself in the style: with any hair style starting from bouncy, tight, spirals to flower-like and loose waves. You can even try mixing two styles for an unique look. Whether you’re going for ringlets or big curls, you will very rarely snag your hair (this is one the benefits of using a curling wand, rather than the traditional iron). The design is appealing to people and certainly fits to the latest trends of hair styling. To see more curling wand like this one, see this page. The Rock N Roller has a very funky shape, so funky that we do not even know how to call it. As you can see on the picture, the wand is straight, but with little “balls” all along it. This helps get a very unique hair style that will look natural, effortless and a bit on the wild side. This funky designed wand heats up in a quick period of just 30 seconds (so no need to wait anymore!). Unlike some older models, it works quite well as the heat is evenly distributed in the entire iron in a mere 30 second interval. It has several heat settings system, for adjusting heat level according to your need. The curling wand is equipped with a light, which tells you whether it’s on or not. This is important as it may prevent injury. The full composition of this wand’s heat technology is of tourmaline and ceramic. This stuff is lightweight and as such you do not have a tired hand after having a curl or straightening session. The protective glove that comes with this product is used for safety measures. It remains cool during the entire time when you are engaged in the curling of your hair, thus preventing any type of burns or other injuries. The security measures maintain industry standards. As mentioned above, firstly it has protective gloves and a safety stand. This wand is made with a tangle free wire, which saves you some hassle. This is unlike many other wands and saves you time and effort during styling. The product at this range is exceptional as it comes with a super warranty period of 1 year. The shape of this wand is straight. This allows you to create curls with more consistency and precision. This is usually better for people who want a sophisticated, yet effortless look. Sultra trademarked ThermaTru Ceramic Technology helps you protect and maintain the health of your hair while using your curling wand. This is a 1-inch curling wand which lets you create curls and waves. The Sultra The Bombshell comes with modern temperature control technology that enables you to create curls on your hair with a constant 3800F heat. The constant heat then ensures that you don’t hurt your scalp and the final look is locked down in the most effective manner. In the end, you will be impressed by the results you get from the use of the curling wand. The Sultra The Bombshell offers you the benefit of rapid heat-up so that you can create your curls faster. The high temperature level also helps to ensure that the curls stay intact for a longer period of time. Therefore, unlike traditional tools which take ages to heat up and even for the curling effect to take place, this one offer you almost instant results once you start using it. This curling wand also comes with a heated glove for purposes of protecting your hands from excess heat. It is quite essential especially if you plan to use the wand frequently. Always remember to wear your glove since the Sultra The Bombshell heats up fast. This product comes with Exclusive ThermaTru Ceramic Technology that mends and then defends hair as you style it at constant temperatures. Again, it features the auto shut-off function just in case you forget to switch off the curling wand once you are done with the job. Just as the case is for the curls, this wand is also meant to last a lifetime. If you can use it in the right manner, it will serve you for the longest time possible. Again, it comes with a durable handle that does not break easily. It stays intact even with repetitive use and still offers the right service at the end of the day. In order to offer you the assurance that the Sultra The Bombshell is meant to offer you the best service, it comes with a 2-year manufacturer warranty. With such duration, you are sure that the manufacturer is dedicated to offer you a product that delivers on the promise. Perhaps you might have to try it out in order to better understand this aspect! The Jose Eber Curling Wand is a 25mm barrel which not only helps to effortlessly create big curls, and voluminous waves. While working with big portions of hair can often be difficult, this tool makes it easy to create a uniform style due to the non-tapered design. Often it can be difficult to have defined curls without having the dreaded crimped edges, but with this there’s no problem as there isn’t a clip, so all the styling with this wand is completely even. Visit this page to see our list of the best curling wands to get for 2018. This curling iron has a set temperature of 410 degrees Farenheit, which means that the heat remains stable as you curl your hair, preventing uneven curls. It uses ceramic heating, which is the most effective material in creating hairstyles that last and don’t drop during the day! The aluminum barrels also have the added benefit of containing tourmaline, which is the best material for fighting humidity effects, which is great if you have finer hair or even just humidity-prone hair and want to keep your freshly styled hair frizz-free. All heat tools have concerns in regards to the heat, so it’s really important that there are measures put in place to ensure the safety of the user, especially if it’s on a regular basis. The button is a simple on/off which is located perfectly in your grip, which is a great alternative to fiddly and confusing settings which can sometimes lead to further hazards. The Jose Eber Curling Wand has a weighted handle, meaning that it’s safe to put on your bench without having to worry about it being a fire concern. So if you did want to keep it on, you could do something like answer the phone without having to miss your call, as well as being able to come back to the consistent temperature. The fact that Jose Eber have included a protective glove with the wand means a lot, as users who may be using a curling wand for the first time may be worried about the heat. This extra layer of protection is a comfort and extra assurance to prevent all concerns. This cord is unique in the fact that is has a 360 degree swivel. This will prevent the cords from getting up in knots as you curl making it a lot easier for the user. The base of the wand also has a hook, allowing for easy storage when you’re done styling your hair. As nice as a workout can be, holding a heavy hot tool is not the time to be flexing your muscles. The Jose Eber Curling Wand is light weight and allows for a more user friendly experience, which is much better for busy folks who don’t have time to be struggling with a clunky curling wand. All Jose Eber products come with a lifetime warranty that covers any failure, whether that be through breaking, failure to heat or any other malfunction. This is a lovely extra assurance for the purchaser. The Conair YOU Waves curling wand is a flexible piece of equipment that helps even the most demanding users set the perfect long lasting curls in the shortest amount of time possible. The YOU waves comes with 2 interchangeable tapered barrels—ranging from 1-3/4” to 1” and 1-1/4” to 3/4”—which you can create a wide range of different hairstyles. Just pick your look for the day and the Conair YOU Waves curling wand makes it reality. Ideal for both short or long hair. This wand was made to give it’s user a wide range of possibilities. See more curling wands like this on this page: https://www.prettycurls.com/best-curling-wand/. The YOU Waves curling wand features four, easily adjustable, heat settings with just the push of a button. The lower heat settings start at 310 degrees Fahrenheit, which is best for those with delicate hair. The wand’s highest heat setting is 400 degrees Fahrenheit, which is ideal for those with thicker and typically more demanding (longer or ticker) hair. 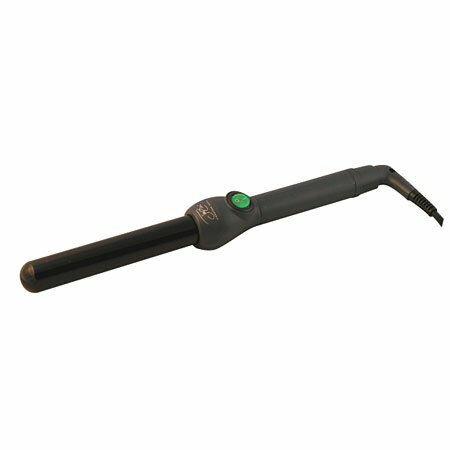 The wand has great heat distribution throughout the wand will ensure professional, shiny and static free results. The Conair YOU Waves curling wand is able to reach it’s highest temperature in less than 30 seconds. Simply wrap and go! Composition: This hair wand provides professional grade Tourmaline Ceramic technology that ensures the best heating results to make your hair smooth and frizz-free in the least possible time. The ceramic made wand will help you define your curls in any way you want and will leave you with the perfect long lasting results without the need to use other hairstyling products. This model by Conair comes with two interchangeable barrels which are easy to remove and replace. This wand comes with a heat resistant 3-finger protective styling glove included.This heat resistance protective glove will help you avoid injuries. This will save you precious time and consideration leaving you worry free to manage the perfect look. It can help protect you and your hair without getting in the way of your styling,covering only the areas that need protection as to not cause you any discomfort while wearing it. Security precautions must be taken in order to avoid injuries and burns. The LED indicators will inform you if the curling iron is in use and in what temperature setting it currently is and a power button will ensure it is turned off even if it is still plugged in. It also incorporates a small stand so you can safely place it anywhere you want without fear of burning your counter,fabrics or sheets. A 3-finger heat resistant protective styling glove is included to enhance your protection as you style your hair. The 4 in 1 Ceramic/Tourmaline Curling Wand by Cortex set is a professional series curling wand that allows you to style a variety of different looks all by using one device. The curling wand comes with four interchangeable barrels made of ceramic/tourmaline leave your hair healthy-looking and silky smooth. Many other traditional curling irons with clips and sub-par metal construction will damage your hair and and create hairstyles that only last for a matter of hours. This curling wand set by Cortex is designed to give you top quality results for an affordable price. Now let’s delve further into the features that make this tool a smart choice out of the many curling tools available on the market. Visit curling wand shopper’s guide to see all of the best options for you. The chief distinguishing characteristic of this Cortex curling wand are the ceramic/tourmaline barrels that can be swapped out of the curling wand handle. The ceramic component releases negative ions into the hair strand, effectively reversing hair damage. Since damaged hair contains produce positive ions, the negative ions from the ceramic cancel the positive to produce healthy hair. Acting with the ceramic is the tourmaline which augments the amount of negative ions that the ceramic naturally emits. So, the tourmaline in combination with the ceramic produces a very effective curling iron. In addition, the ceramic and tourmaline curling plates use far-infrared heat technology and eat up to 450F. This means that your hair will receive even and efficient heat distribution which is important as a way to protect from damage. Products that heat at lower temperatures and unevenly require more setting time, causing a greater likelihood for damage. There are four different sizes (½”, 1”, 1 ½”, 2”) that come with the curling wand which allow you to try out multiple sized curls from tight ringlets to lose waves. If you are the kind of person that likes to experiment with your style, then the four different barrels will be a great option for you. Or, even if you’re hesitant to try a different size, try going outside your comfort zone and experiment. The versatility provided by this tool will unleash your creativity. The ½” barrel is great for producing tight ringlets or for curling hair that frames the face. The 1” and 1 ½” barrels are great for either tight curls in an updo or can be gentle combed out for romantic, tousled locks. With the 2” barrel, you can curl your entire head of hair and get a natural, beach wave look. Whatever style you choose, you’ll find that the ceramic/tourmaline wands produce long-lasting curls that remain styled for the entire day or evening. 4 ceramic/tourmaline heads made of professional quality with ionic technology. The interchangeable barrels come in four sizes: ½”, 1”, 1 ⅕”, 2”. Built-in auto shut-off feature with digital temperature display. Cord attaches at a swiveled end & 11” in length. Uses even heat distribution from its far-infrared heat technology. Notice: that this curling wand comes with a glove and a bag you can use for storage. The Cortex 4 in 1 Ceramic/Tourmaline Curling Wand is a professional, salon-quality curling wand that uses the latest in beauty technology to deliver professional level results at a price that the average home user can afford. Because of its clipless design, this curling iron produces natural looking curls that do not have unsightly clip marks. And its also because of this design that you will be inspired to try a variety of hairstyles since the barrels are interchangeable and come in four different sizes. These features and more make this Cortex curling wand a very smart addition to your beauty wardrobe.